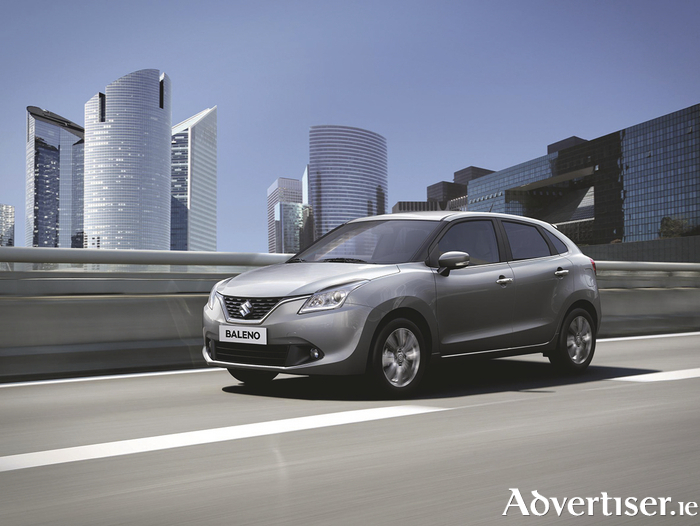 Suzuki has not only introduced a new Baleno but it also sits on a new-generation platform. Offering increased rigidity and reduced weight, enhanced fuel efficiency, handling and stability, it still achieves high levels of safety and NVH performance. The exterior “Liquid Flow” design theme is based on an energetic mass of liquid in motion and is articulated by curving lines and expressive surfaces. Nine body colours include “Premium Silver Metallic”, which emphasises the body’s curving lines, and “Ray Blue Pearl Metallic" (on some models ), which changes from a green hue to a red tinge, depending on surrounding lighting conditions. There will be a choice between 16-inch alloy wheels or 15-inch steel wheels depending on the model chosen. Depending on the spec level, some models will have a large, high-definition colour LCD display in the instrument cluster shows performance and other information through user-friendly graphics. Highlighted features include driving G-force, engine output and torque, accelerator/brake operation, and energy flow (for vehicles with SHVS ). Some versions will have a smartphone linkage audio display with a 7-inch touch panel screen that has a USB port and SD card slot and displays the view behind the vehicle by way of a rear view camera. Another option and probably on top-end versions will be a unique circular display and a high-contrast LCD panel highlight the automatic air conditioner. The new Baleno features the 1.0 BoosterJet engine, which has a maximum output of 82kW and a maximum torque of 170Nm. It is a newly developed direct-injection turbo engine that achieves both good fuel economy, which is made possible by using a small displacement, high torque turbocharger. Some versions will have SHVS, a mild hybrid system developed by Suzuki that uses an integrated starter generator to assist the engine during acceleration and also generates electricity through regenerative braking, which it does more efficiently than systems using conventional alternators. An intuitive suspension has been developed for direct-response handling with MacPherson struts and coil springs up front, and a torsion beam and coil springs in the rear. Reduced rolling resistance tyres improve fuel efficiency without sacrificing directional stability, ride comfort, and braking performance. Suzuki says the Baleno not only achieves spacious passenger comfort, but also best-in-class luggage space. A key element in achieving this within an overall body length of less than four metres is a new-generation platform that enables efficient use of space plus a more-compact engine design with a less-tilted mounting position that also frees up more interior room. Safety performance for assisting the driver and mitigating injury in accidents is enhanced by a number of safety technologies, chief among which is radar brake support. With RBS, when the vehicle is travelling at a speed greater than approximately 5km/h, millimetre wave radar detects any vehicle that might be directly in front. Upon detecting a potential collision, depending on the situation, the vehicle 1 ) alerts the driver, 2 ) increases braking force, or 3 ) automatically applies the brakes. Other safety features include ESP®, six SRS airbags and an impact absorbent body. Various components have also been designed to lessen injuries sustained by pedestrians in vehicle-to-person collisions. The new Suzuki Baleno provides an interesting option for car buyers in this class.